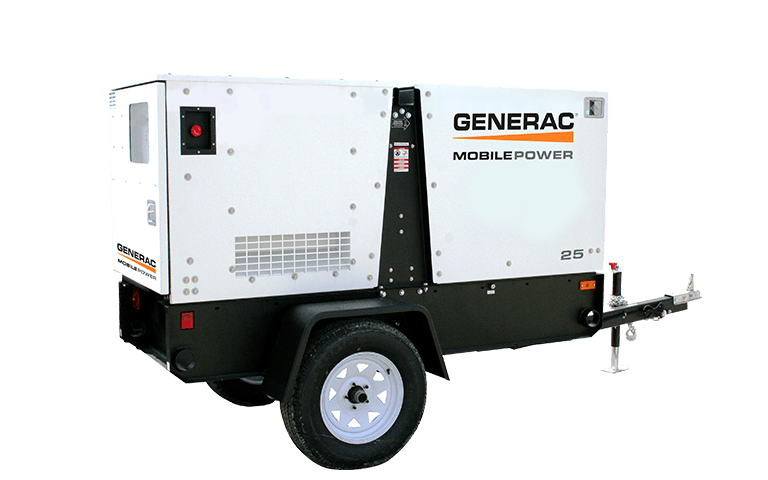 The MMG25FHI Flip-hood Generator; powered with the proven Isuzu 4LE1-PV05 diesel engine, trailered for mobility to and from site, featuring the revolutionary Patented Flip-hood enclosure. The MMG25FHI generator has two access hoods that flip wide open to allow for unobstructed accessibility to the generator’s internal components. The front service hood easily flips open providing complete accessibiity to perform daily operator checks and routine maintenance. The back hood flips open to provide access to the generator end and electrical connections for full service. The control panel of the MMG25FHI is centrally located at the rear of the generator allowing for a full view and larger access of all of the electrical connections, wiring and digital controller. The trailer tongue of the revolutionary flip-tongue design flips up on the MMG25FHI generator permitting cross-trailer loading for shipment allowing up to 10 generators per truckload.